Sometimes, you just need more pictures in your life… and that’s why I put that goal on my Thirty before 30 list. Thankfully, the day before my birthday, I got all of these pictures up on our wall. Yes, it’s a weird setup, but let me explain a little more. I love projects that cost very little to no money, and this was one of those projects. I wasn’t sure, when I put that goal on my list, how I was going to display more pictures. 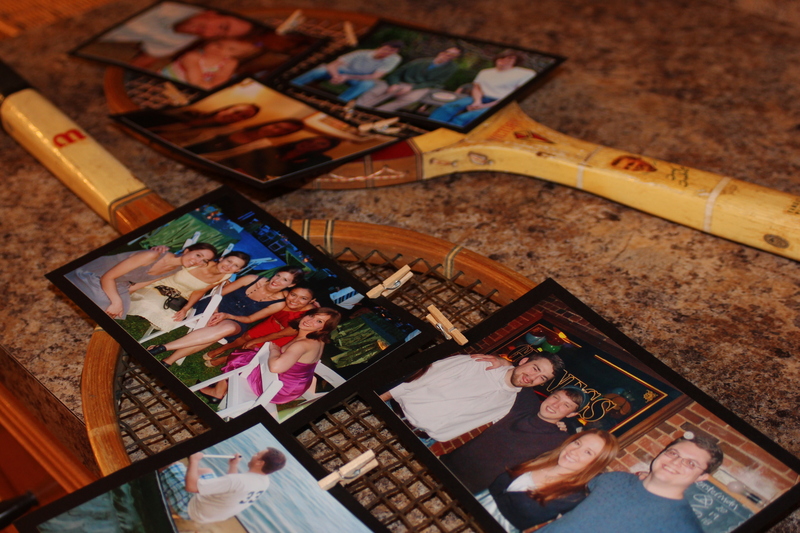 But, when JD’s parents gave me a few old, rustic looking frames, including the one above, I started getting a couple of ideas. 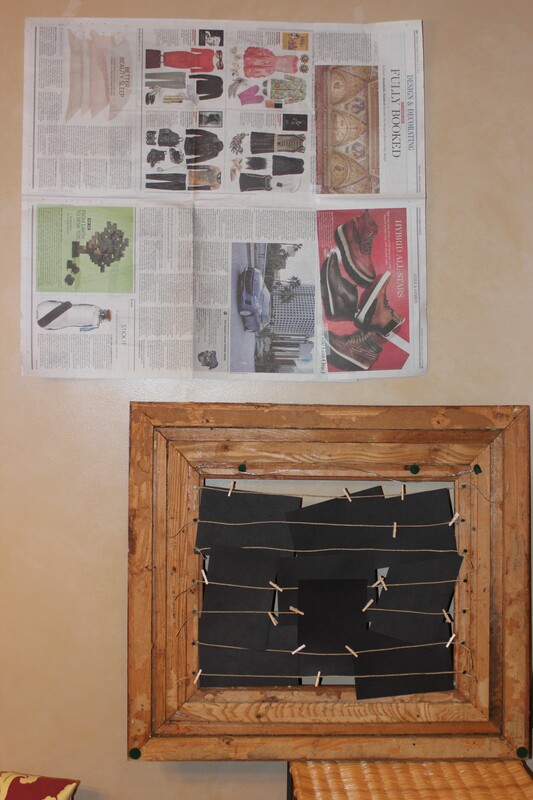 With a little bit of twine and mini clothespins, I assembled several laundry lines behind the frame in order to create a screen. Then, I clipped pictures to the front. The picture below is the back of the frame, along with method of hanging the picture on the wall. But, I still had more pictures to hang, and I wanted more than just nine on the wall. I remembered the old racquets I had found while going through Maw Maw’s house (remember this?) and decided that maybe I could incorporate it into the picture display. I polled five of my favorite artsy girls, and most gave me the thumbs up to try it. I was worried it would be a little “Royal Tenenbaum”-esque and kitschy, but I think I like it. JD confirmed it was cool, so I knew we were in good shape if my more conservative-in-decoration guy gave me the thumbs up. I really think I love the look… it’s weird, but I do take random chances with our decorating… and I think it pays off. The non-traditional idea saved money (total of $10 spent on this project, including photo printing) and it gives our kitchen even more character! And, as JD told me a few days ago while in the kitchen about to head out for work, it just makes you happier to have the visual reminder of your friends and family in pictures. 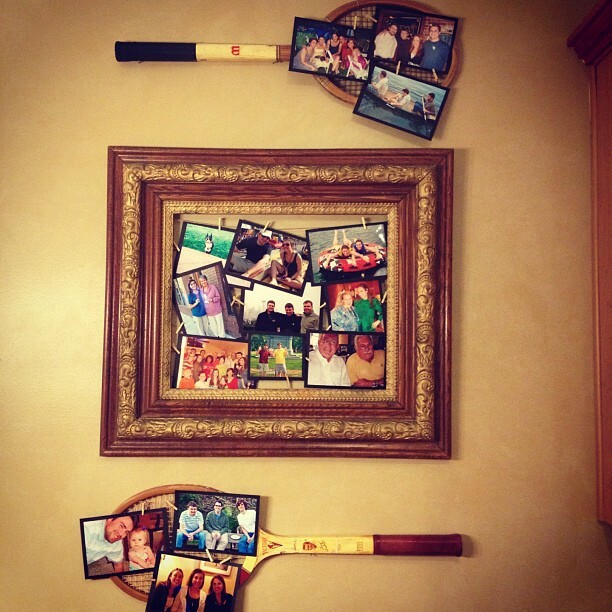 Getting to see your loved ones displayed on the wall every day puts a smile on your face! I plan to do a few more frames like the original one, hopefully as our photo catalog increases, but I’m so glad I got this project started.